Macular degeneration includes several conditions that affect the macula which is an area at the back of your eye that you use for seeing fine details, like in the case of reading. As these conditions do not affect your side vision you still have the ability to walk around, but you will have difficulty performing certain tasks such as reading or watching television. This eye condition occurs when the macula at the back of the eye becomes damaged, making it harder to see fine details. It usually happens as one gets older, even though some younger people may also have macular degeneration caused by a genetic condition, but it is less common than age-related MD. Does MD lead to blindness? Macular degeneration is the leading cause of blindness in the UK. However, many people with this condition can manage well enough to walk around by using their peripheral (side) vision, but they may not be capable of reading without a magnifier anymore. Can I protect myself from age-related macular degeneration? The main known risk factor for developing this condition is smoking. Apart from quitting this habit, eating a lot of oily fish, coloured fruit, and vegetables may also reduce the risk of developing MD. Some supplements such as Icaps or Macushield may help. Additional factors that increase the risk of MD involve having a family history of the condition, obesity, and having blue eyes. Exposure to ultraviolet light is also believed to be linked to the cause of the condition, moreover it is more common in Caucasians and women. Is it possible to treat age-related macular degeneration? AMD has two different types: dry and wet macular degeneration. Dry MD, in which yellow deposits build up behind the macula, is more common than the latter, and it normally happens slowly. At the present no treatment is available for this variant. However, your vision can be improved by magnifiers which your optometrist can advise you on. Wet MD happens when there are abnormal blood vessels growing behind the macula and they leak fluid. If you notice that your vision is suddenly distorted and straight lines appear to be wavy, or you have a blank spot in the centre of your vision you need to see your optometrist straight away. It can be treated if it is recognized at an early stage, normally by injecting a drug into the gel inside your eye. 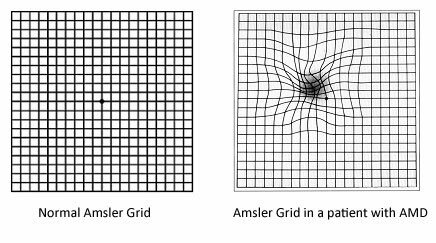 The Amsler chart (a grid of squares printed on paper) is created specifically for the purpose of testing whether you have macular degeneration or not. Look at the chart about 30cm (12 inches) from your face. If you wear reading glasses or contact lenses, use them for the test, but do not wear varifocals or distance glasses. Cover one eye, and look at the black dot in the middle. Now check the other eye. If you notice lines that are wavy, broken or missing, you should contact your optometrist immediately.